Classic Flame 60" Burnished Walnut TV Console Pasadena TS-28MM468-W502. 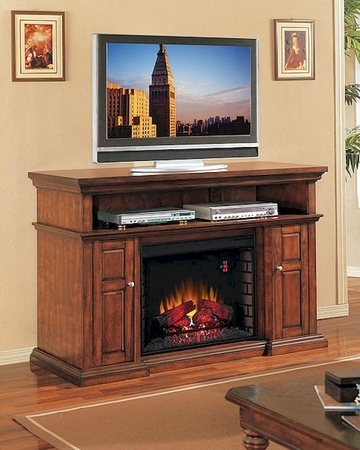 The Pasadena TV console provides ample audio/video component and media storage with adjustable shelves, surrounding a 28” ClassicFlame Electric Fireplace Insert. Its generous 60” width can accommodate up to a 56” LCD or Plasma TV. 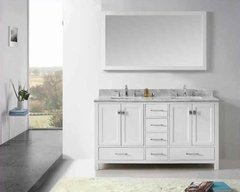 Featuring decorative brushed nickel door pulls, The Pasadena comes with 3 door inset options: a set beveled glass, framed wood and speaker cover door panel insets which can be mixed and matched. 1 x 60" Fireplace TV Console TS-28MM468-W502. TV Console - 60.0"w x 23.0"d x 40.3"h.
Interior Dimensions of side cabinets: 11.25"w x 20.25"d x 24.75"h.
Ample shelf storage for electronic media components. Tiered mantel top to support today's televisions. Left and right side storage. • Speaker grill (conceal your speakers within tconsole). Adjustable shelves are finished on five sides. 3-way adjustable concealed euro hinges.